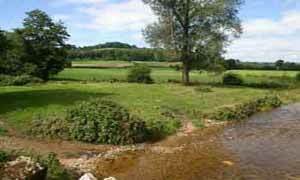 Colyton is an ideal centre to explore the beautiful Coly valley. Jane Austen visited the vicarage. She may have stayed there as well en route from Bath to Sidmouth. The Vicar of Colyton had been her father's pupil. This exhilarating walk requires determination and a sense of adventure - stretches can be wet after a heavy rain and various stiles are to be negotiated. A GPS will be also be handy as ,depending on the season,paths in the beginning up to Tritchmarsh imay lack clear definition. Towards the end,the walk follows part of the popular East Devon Way.